Q: Is the cost of materials included in tuition? A: Yes. Not only is UNOH’s online MBA program exceptionally affordable, but the costs you incur are even less, as we include the cost of materials. No additional textbooks are required. A: It is recommended that you log in to your online classroom on a daily basis. At a minimum, you should log in to your online classroom at least three times per week. If you do not, you risk falling behind. A: No. 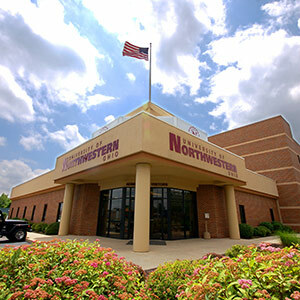 The coursework at University of Northwestern Ohio is 100% asynchronous, meaning that there are no set meeting times unless special arrangements are made with the instructor. Q: What is the lecture format? A: There are 10 modules (and 8 modules during summer quarter) with homework, drop boxes, and discussion boards. Many courses have video or audio components. All courses utilize the discussion boards. Q: Are there group projects involved in the online programs? A: Yes. In some courses, group projects are required and full details will be made available by your course instructor. Q: Will I be required to complete a thesis at the end of my program? A: No. UNOH does not currently require the completion of a thesis at the end of the MBA program, but all students are required to take MBA 690 – Management Capstone. Q: Why doesn’t UNOH require that I take the GMAT exam to be admitted to the Online MBA program? A: UNOH chooses not to use this academic measure to exclude individuals who have a wealth of real world business experience and enormous potential for program success. Read more about the value of an online MBA without GMAT requirements. A: Your instructor should typically respond to your questions within 48 hours of receiving your message sent through Blackboard or email. A: Yes, you are able to take time off from your program. Students wishing to take a break from the program must contact the Dean of Online Programs & Graduate College, Lisa Clark Ph.D., at (419) 998-8875. A: Yes. You must complete the MBA program within five years. Q: If I run into an issue with an online course is there anyone I can contact? A: Help is available online 24/7 through Blackboard Student Services, or toll free at (866) 425-8437. For course specific questions, you can contact your professor.